Georges Méliès as the magician in Escamotage d’une dame chez Robert-Houdin (The Conjuring of a Woman at the House of Robert-Houdin, Star Film, 1896) (link here) . Born in 1861 in Paris, Georges Méliès started his artistic endeavors as a child. By the age of ten, he was building his own stage sets for marionette shows and drawing caricatures of his teachers. Méliès continued his artistic and theatrical pursuits, including studying magic, despite his father wanting him to work solely in the family shoe business. In time, the family business was successful enough that Méliès was able to buy his own Paris theater: Théâtre Robert-Houdin. By 1888, he began staging performances as a comedic magician and illusionist in the theater. At the time Méliès also worked as a caricaturist and was associated with Les Arts Incohérents, a socially and politically minded group of avant-garde artists who often employed caricature as a form of social satire. Méliès’ foray into cinema started when he attended the public unveiling of the Lumière brothers’ Cinématographe camera on December 28, 1895. The Lumière brothers used the camera to shoot and present their first film Sortie de l’usine Lumière de Lyon (Workers Leaving the Lumière Factory). Méliès was so taken by the film screening that he attempted to purchase a Lumière camera, but to no avail. Ever a man of ingenuity, Méliès paid a visit to English engineer and instrument-maker Robert Paul who was making his own version of Edison’s Kinetoscope camera. Méliès purchased one of Paul’s cameras and augmented it to both shoot and project film. 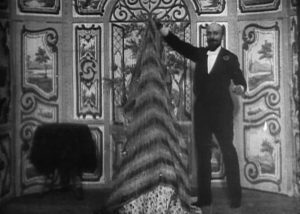 Georges Méliès, Le Illusion (Star Film, 1907). Image published in Georges Méliès, Mage (1945). By the spring of 1896, Méliès was showing films at the Théâtre Robert-Houdin. That same year he started creating, producing, and showing his own work. His work runs the spectrum of film genres including: comedy, fantasy, science fiction and even early horror. Méliès style is very theatrical, comedic, and includes elements of magic and illusion. Méliès employed theatrical stage techniques and settings. To his theatrical bag of tricks, Méliès added cinematic editing, special effects, and double exposure to achieve his signature style. This became a style more aligned with caricature, satire, and early modern art than with artistic realism and the actuality film style of the Lumiere brothers, which was also popular at the time. Actuality films use footage of real events, places, and things without the narrative message of documentary films, which actuality films historically precede. 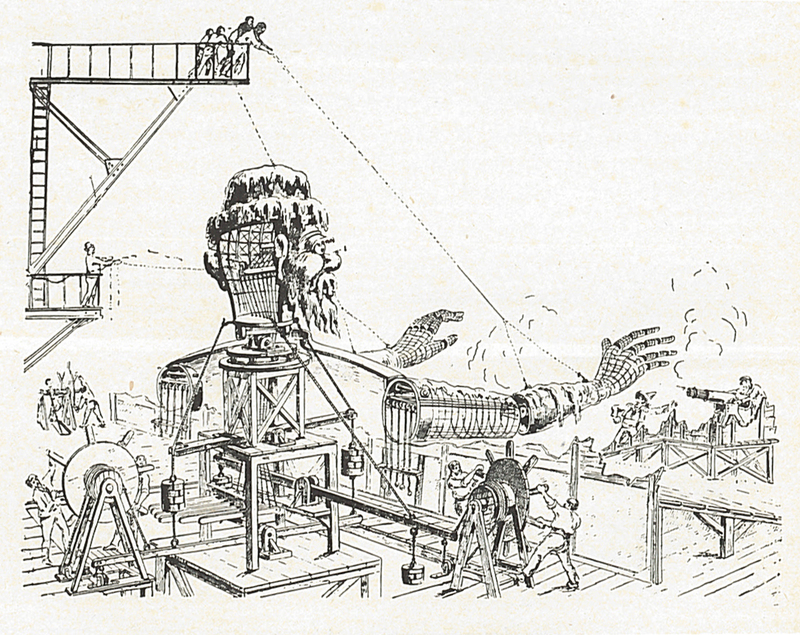 Drawing depicting the workings of a giant puppet used in Georges Méliès’ film Conquest of the Pole (1912). 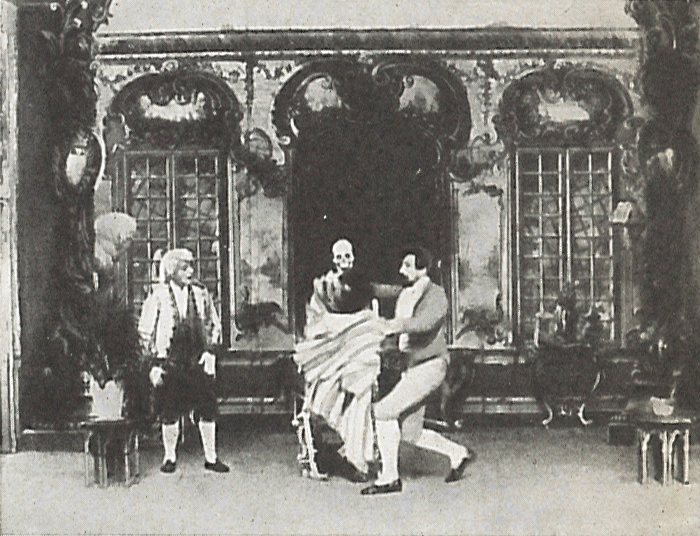 Image published in Georges Méliès, Mage (1945). (De la Terre à la Lune (From the Earth to the Moon)) and H.G. Wells ( The First Men in the Moon) to create what is arguably the first science fiction film. Voyage employs a type of visual collage that pulls from various sources and contemporary ideas of what the surface of the moon and its inhabitants might look like. 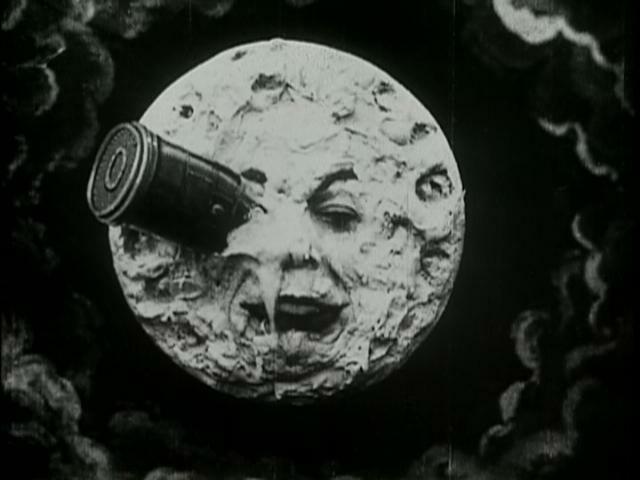 Georges Méliès, Le Voyage dans la Lune (Trip to the Moon, Star Film, 1902). Image courtesy of Flicker Alley and the Blackhawk Films Collection. In From the Earth to the Moon (first published in 1865), Verne references various accounts of the moon including astronomical observations of the time. In particular, Verne mentions Edgar Allan Poe’s lunar adventure Hans Pfaall and Great Astronomical Discoveries Lately Made…, also known as the Great Moon Hoax of 1835. Great Astronomical Discoveries Lately Made… was written by Richard Adams Locke for the Sun Newspaper, New York in which it was reported that life was discovered on the moon. In From the Earth to the Moon, Verne describes the moon as craggy, mountainous and snowy, having crevices and craters, and containing a subterranean world. 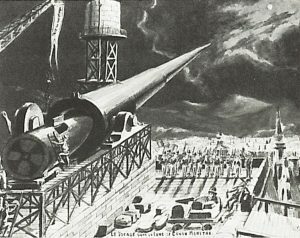 Verne’s influence on Le Voyage dans la Lune can be seen in Méliès’ depiction of the lunar surface, the appearance of snow, the presence of a subterranean world, and most notably with the cannon and the rocket sent to the moon. 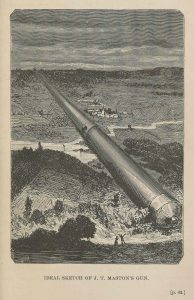 Cannon used to shoot the rocket to the moon in Verne’s De la Terre à la Lune (From the Earth to the Moon, 1874) (link here). Georges Méliès drawing of cannon used in Trip to the Moon inspired by Jules Verne. Published in Georges Méliès, Mage (1945) (link here). The crew of two aeronauts in Wells’ The First Men in the Moon (first published 1901) crash landed their rocket as did the crew in Méliès’ Le Voyage dans la Lune. While at first the moon appeared grey and lifeless, the crew in Wells’ novel soon witnessed rapid plant growth with the arrival of sunlight. Lunar life, known as Selenites, were encountered by the crew in The First Men in the Moon. 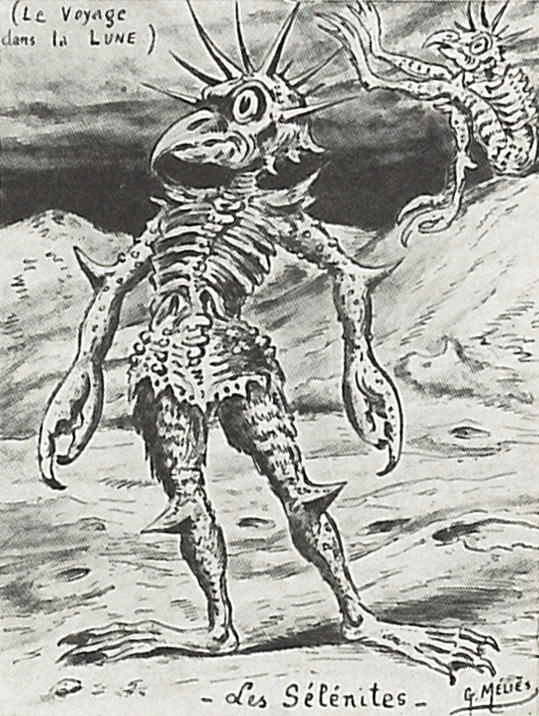 The Selenites were dressed in what Wells described as crustacean like armor and lived in a subterranean world, which is very similar in description to the lobster like quality of Méliès’ Selenites. Concept drawing of a Selenite by Georges Méliès for Le Voyage dans la lune (A Trip to the Moon). Published in Georges Méliès, Mage (1945). After feasting on a mushroom like fungus, the two aeronauts in The First Men in the Moon were discovered by the Selenites, captured and taken underground. Similar to Méliès’ Le Voyage dans la Lune the aeronauts fight the Selenites and escape. While it is clear that Méliès borrowed much from Verne and Wells, he had his own creative take on the fantastic voyage to the moon. When his films fell out of vogue, Méliès briefly returned to theater before financial failure forced him to quit the industry entirely, at which time he turned to selling toys at the Gare Montparnasse train station. He eventually retired to a home for cinema veterans. His surviving work was rediscovered in the 1930’s and he has now taken his place as one of the earliest pioneers in cinema. To find out more about how astronomy inspired Jules Verne and the 19th century imagination checkout the Infinite Worlds section on the Fantastic Worlds exhibition website. 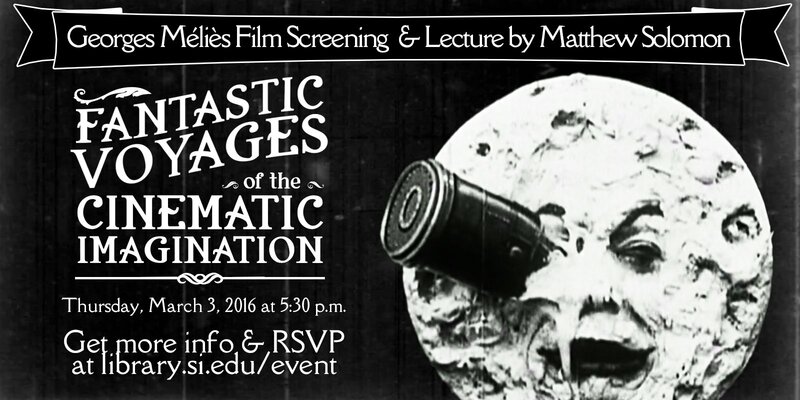 To learn more about Georges Méliès, Smithsonian Libraries is hosting a film screening and lecture, “Fantastic Voyages of the Cinematic Imagination”, on Thursday, March 3, 2016 from 5:30-7:30 PM in the Warner Bros Theater at the National Museum of American History. Fantastic Worlds: Science and Fiction 1780-1910 exhibition is running through February of 2017 in the Smithsonian Libraries’ exhibition gallery located on the first floor (One West) of the National Museum of American History 14th St and Constitution Ave NW, Washington, DC. I’m thinking that the image is in the public domain by now, but I would like to quote part of your article along with it, and cite the article as my source. Thank you for your inquiry! The image comes from a 1945 book about Melies. The full catalog record is here: http://s.si.edu/2pAJGaa. It’s possible that the image is still protected by copyright. You are welcome to quote our blog post or exhibition website in your work, with credit.